The toes of the front feet of the raccoon are not only long and slender, but they also possess a highly developed sense of touch, and play large role in the raccoon’s harvest of plant and animal foods. The notion that a raccoon washes or must moisten food is a myth. Salivary glands are well-developed and the tendency for this mammal to manipulate food items in water is not related to a need to wet or wash them; in fact, many foods are consumed unmoistened. Much of the activity probably functions in locating, capturing, identifying, and orienting (placing in the mouth) food. Raspberries, black cherries, beechnuts, acorns, corn, apples, and fungi are some plant materials prominent in the diet of the omnivorous raccoon. 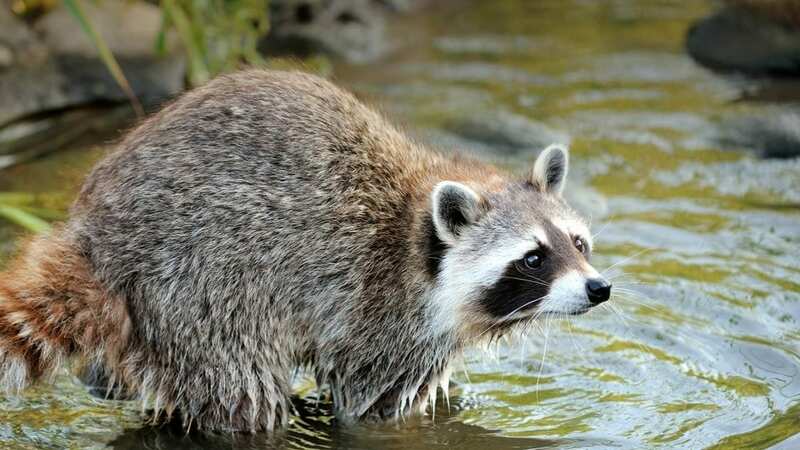 Birds such as ducks and their eggs, turtles and their eggs, mice, voles, bats, cottontails, muskrats, ground and tree squirrels, fish, snakes, and frogs are examples of raccoon prey. Invertebrates (insects, earthworms, freshwater mussels, and especially crayfish) are a major dietary component, too. The raccoon eats both the flesh of dead animals (carrion) and garbage. Raccoons, like bears, may enter homes and camps in the Adirondacks and pilfer food supplies, and in autumn, consume quantities of sunflower seeds from feeding stations. This animal is well-known for its fondness for raiding sweetcorn patches.